I will preface this review with the fact that whilst owning multiples of this set, they are purely for investment purposes and am reviewing a friend's build. At 2025 pieces with 12 minifigures (including a skeleton), this is the largest of the Harry Potter sets and arguably the greatest. The first impression you get looking at it simply "Wow!". The set contains 3 of the buildings seen in the 8 Harry Potter movies, coupled with an array of minifigures. This massive set contains many little features relevant to Harry Potter fans whilst providing a variety of colours and parts that simply screams "BUY ME NOW!". The Harry Potter minifigure variation is skin toned has a dark blue open jacket with as tripe and black legs. It was also available in sets 4840 The Burrow and 4866 The Knight Bus. The Fenrir Greyback minifigure has no variations and is also available in set 4840 The Burrow. The Lucius Malfoy minifigure variation is skin toned and also available in sets 4736 Freeing Dobby and 4867 Hogwarts. The Rubeus Hagrid minifigure variation is skin toned and has a brown overcoat with buttons. It was also available in sets 4738 Hagrid's Hut and 4865 The Forbidden Forest. The Goblin minifigure variation has light bluish grey legs and is only available in this set. This Goblin minifigure variation has reddish brown legs and is only available in this set. This Ollivander minifigure is only available in this set. This Hermione minifigure variation has a light bluish grey sweater and is only available in this set. This Ron minifigure variation is only available in this set. And finally we have our favourite "minifigure" the generic skeleton! He is available in over 100 sets, is definitely not exclusive and I am certain most of us wouldn't consider it a minifigure. Lego's description even doesn't include him as one yet Brickset have. At any rate, we get one. So in conclusion, this set yields 7 exclusive minifigures (though some are variations) which is excellent for any theme. The others can be collected through mid-priced to low sets, but as the theme has become discontinued, finding these cheaply is becoming increasingly difficult. Onto rare pieces! The following pieces are unique to this set either due to the element itself or colour of it. There are other parts that are generally fairly difficult to come by, however these parts (outside of the minifigures) are currently only available in this set. Breaking down the minifigure and parts list, this set has many desirable and exclusive pieces, making it an extremely attractive feature of this set. The instructions are featured over three manuals, each detailing the completion of an individual building, the dark and spooky Borgin and Burkes, the grand, old-fashioned style Gringotts Bank and the classic styled Ollivander's Wand Shop. In addition to the three buildings, there are two lamp posts as well as three market stalls selling wizard hats, cauldrons and pets respectively. The build is not difficult, though the curved roof on Borgin and Burkes may cause some tiny issues. Ollivanders Wand Shop contains some neat little features. The desk "explodes" during the wand testings. The ladder allows Mr Ollivander to reach the wands stacked monstrously high, with the wand boxes being stickers on 1x2 tiles. Finally there is a unique method of using whips as a design feature! The design does give the impression of being truly inside Ollivander's cluttered store! This build is straight forward and simple enough for most Lego enthusiasts. One neat feature is that Borgin and Burkes contains a lot of 1x1 glow in the dark tiles. The building also features a fire place to connect to the Floo network (and to the Burrow, as seen in Harry Potter & the Chamber of Secrets) which also rotates when twisting the chimney. The store also possesses a Vanishing Cabinet which connects to Hogwarts (as soon in Harry Potter & the Half-Blood Prince). Inside the cabinet lurks a nasty surprise..... our infamous Death Eaters! The sloping columns of Gringotts look magnificent with the exterior being a neat build though the walls get a touch monotonous. Sadly the interior is rather disappointing. It possesses a small swinging chandelier, a desk and a vault containing the Philosopher's Stone. This building is all about the exterior but did require a bit more thought as to what else could be implemented inside. The below table will show price per piece values of some of the larger recent Harry Potter sets from initial retail prices. From initial retail prices, Diagon Alley was superior at a price per piece ratio than it's other Harry Potter counterparts. But how does this translate now, with the theme having been discontinued? Want a Harry Potter set that gives you "bang for your buck"? This is the one. Cheaper per piece upon retail, and significantly cheaper still even with them having gone EOL. Oh, did I mention the minifigures? There is A LOT to love about this set, because it gives buyers a lot. Harry Potter. Estimated 500 million books sold. Nearly $8 billion in box office tickets. Popular much? It is a financial juggernaut. Does this translate into great sales though? The Harry Potter theme currently has a CAGR of 16.32%, but let us not forget this theme has been around since 2001 and has some smaller sets dragging it down. Let us compare the recent larger sets again. What does this tell us? Lego looooooove making Hogwarts! It shows that the reissues over the years haven't really affected the Castles a great deal, and they have all made very solid gains. The Motorized Hogwarts Express drew in train enthusiasts as well. The theme is capable of pulling in big dollars and continues to remain popular. This set was released in January 2011 and discontinued in early 2013, giving it the standard 2 year shelf life. It was available in many stores and easily accessible to consumers. The larger set and hence higher price point may have been a deterrent; however the excellent price to piece ratio made it worthwhile. To begin with, let's look at the box art. The front cover is excellent. The Harry Potter and Lego logos effectively stand out and grab the attention of the consumer. Then predominantly featured are the buildings themselves, organised in a nice array which encloses the minifigures into Diagon Alley. 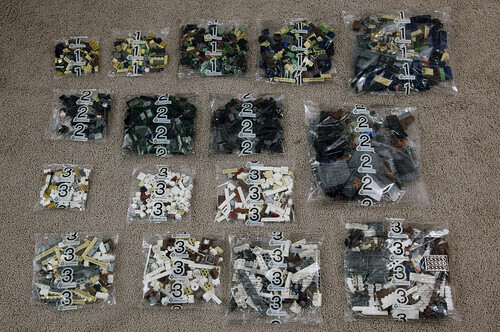 A quick glance down the bottom left corner shows all the minifigures, stretched out to over a third of the box length. The back cover is also well designed. It gives each building space to enable close examining, while also showing the minifigures interacting with their environment. The plain, parchment style background enables the images to stand out. In terms of the box itself, the cardboard is not as thick as what it could be, certainly not as strong as the 7938 Passenger Train, though it is the same size. The size of the box is a welcome surprise considering it contains 2025 pieces. The set is divided into three sections for the three building; Ollivanders is numbered 1 and requires 5 bags, Borgin and Burkes numbered 2 and requires 4 bags and finally Gringotts is numbered 3 and requires 7 bags. The Harry Potter theme currently has a CAGR of 16.32%. The Diagon Alley set is already achieving fantastic growth since it went EOL. Currently, new sets have jumped a whopping 47.85% since retiring, and currently is easing back after a quick climb in price. After slowing down, the used sets are beginning to rise quickly as consumers look to grab them as a cheaper alternative. New sets are churning along at a CAGR of 19.63%, above the theme's average. In 2001 a set was released named 4723 Diagon Alley Shops. Whilst this was a very small set compared to this monster, I believe it is important to look at regardless. Though released 12 years ago, the 4723 set has increased 422.42%, a CAGR of 14.77%. What can be concluded? Fans like Diagon Alley, even if it were a very ordinary, basic set. Though the 3 other sets have significantly greater returns from retail thus far, they were also released longer. Thus far returns between 19.63% and 33.59% are excellent. The 10217 and 4842 sets have lower CAGR returns at this stage, but they are also much larger sets and were discontinued later than the other two sets. The latest Hogwarts reiteration may be hampered by the previous releases, yet Diagon Alley has no such issue. I expect the latest Harry Potter releases to gain some serious traction in the leadup to Christmas. What then though? Well the future becomes a little more clouded. There are no more Harry Potter books or movies on the horizon, and for the immediate future, his world is over. Will this hamper growth? Will people forget and will the theme become irrelevant? Or, what would happen to this set's value should J.K Rowling decide to dabble into the Potter universe once more? At this stage, the movies are scheduled for a re-release in 3D in 2017. The 3D re-releases of Star Wars were cancelled due to dwindling interest after the Episode 1 reissue. Will the Harry Potter franchise suffer the same fate? This is one high quality set, and one of the best in the Harry Potter theme. The largest in the line, packaged well, aesthetically pleasing and containing plenty of playability, this set appeals to everyone. The interesting building shapes, designs and colours would be enough to draw in most Lego fans, with the wonderful collection of rare minifigures the icing on the cake. The only issue with the set is the interior of Gringotts but it really is only a minor quibble. This set is a must have for not only Harry Potter fans, but all Lego fans in general. Placing my investor hat on, this set has many attributes that will help lead it to a successful afterlife; a large set (arguably the flagship), a great range of exclusive minifigures and a popular theme. Previous sets in the Harry Potter theme have produced excellent returns, with even the latest releases beginning to pick up the pace. Though investors may have missed the initial price surge, there is still plenty of room for growth in the future. The only concern is whether Harry Potter will be forgotten and placed on the back burner with a severe decline in interest. Though there are enough fans throughout the world, is that enough to ensure people continue buying sets into the future, especially as the fans get older. However, should Ms Rowling decide to re-enter the Potter universe?